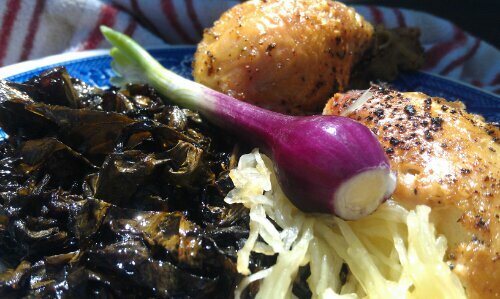 Roasted chicken with 1-2-3 collard greens, spaghetti squash, and garden onion. A sure-fire winner and super easy. A family favorite. 2. Mix salt, ground pepper, garlic powder, and onion powder in a small bowl. 3. Rinse chicken and pat chicken very dry with paper towels. If there is twine, you may leave it in place while baking. Check the chicken cavity for any parts the butcher put in there and remove them if included. 4. 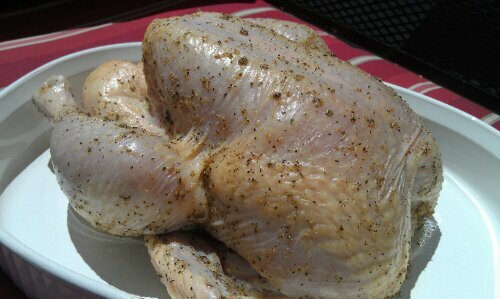 Rub chicken liberally with olive oil with your bare hands. 5. Sprinkle the seasoning mixture all over the chicken and rub in, legs, breasts, wings, and all. 6. Place chicken in a shallow baking dish, a 9X13 glass dish works well, with the BREAST side up. 7. Bake chicken about 45 minutes, depending on how hot your oven cooks. 8. Check with a meat thermometer. You want the internal temperature to be at least 165 degrees. Caution: check the densest part of the chicken. I actually like to cook it to 170 degrees. If you don’t have a meat thermometer, err on overbaking without burning the skin. Take out the chicken if the skin begins to burn. However, you want the skin nice, brown, and crispy. 9. We start by carving the breast on top first. The skin is edible, despite the common practice in the 80s and 90s of removing it. We didn’t know what we were doing back then. I have senior photos with big hair to prove it. Then we drizzle the drippings over the meat like a gravy. The legs and wings may be gently manipulated and cut through with a knife. Free-range chickens have the best fatty acid profile (more omega-3s) to benefit you. Look for those if you can find them. Everyone in my family, all three kids included, love this chicken. Super easy and delicious. I’m trying to get people interested in cutting out processed foods from their diets and cutting back on grain products. On Facebook, I am posting what we eat all day for a week. Check out our grain-free, GAPS, SCD, Paleo, Primal, whole food-friendly meals…The Homeschooling Doctor. 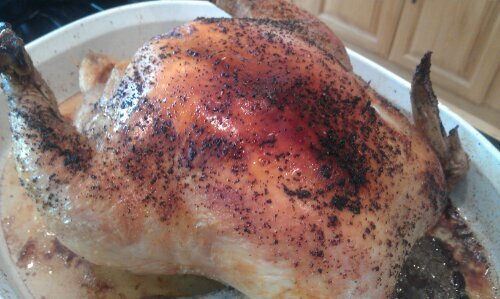 Chicken, breast side up, ready to be roasted. This entry was posted in Recipes and tagged dairy-free, easy gaps meal, easy roasted chicken, gluten-free, paleo, primal, SCD, whole 30 on June 27, 2013 by thehomeschoolingdoctor. I am a medical doctor, and I want to know …can you live without grains? About one year ago, I started aggressively searching for ways to get my once or twice monthly bowel routine to step it up. 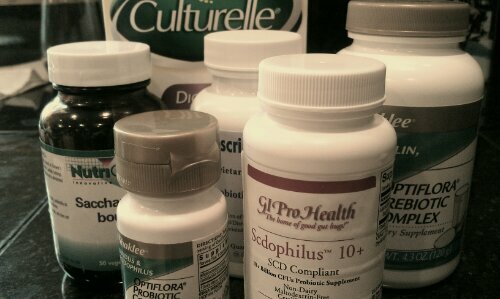 I really was just hoping one of those natural supplements would do it for me: aloe vera, magnesium, milk thistle, chia seeds, Saccharomyces boulardi probiotic…but fate wanted me to work a little, no–a lot, harder than that. I stumbled across unreasonable people declaring that I had to give up gluten and dairy. Tried it. No good for me; took care of my daughter’s problem. Then I stumbled across loonies saying I needed to give up grains altogether. No way. A human being can’t live without grains. It’s the bottom of the food pyramid. The rock-bottom foundation. 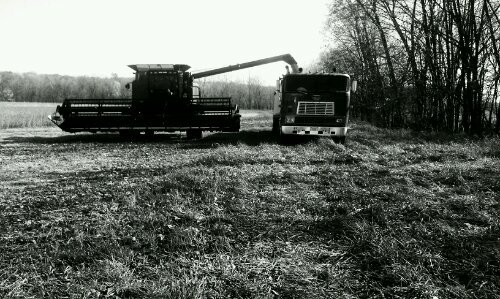 My dad’s a farmer. I can’t give up grains. Not only did I give up grains, I picked a crazy diet called GAPS to stick to for a year. I wanted to give it all my effort and prove to myself that food really does not make a difference, so I could eat my cake and cookies in peace. Since the word diet makes me cringe and want to eat more bad stuff, I prefer to call what I’m doing “nutritional intervention”–even “nutritional rehabilitation,” if you will. Because really, that’s what it is. Problem identified. Intervention being undertaken. Can a human being live without grains? Yes. Before agriculture, humans lived on hunting and gathering: meats, fruits, and vegetables. Seeds (grains) would have comprised exceptionally little of their diets. Think wild grass weeds growing in the back field or along your favorite hiking trail. Inuits (Eskimos) did great on a no-grain diet, before the violation of their food-culture with the American diet. By the way, have you ever eaten wheat grains? I grew up on a farm. I have. I scooped a small handful out of the grain truck, chewed a few bites, and called that good enough for me–running off to go grab a red popsicle from the deep freeze. There is nothing, absolutely nothing, you get from grains that you cannot obtain from another food source. Let me repeat. There is nothing, absolutely nothing, you get from grains that you cannot obtain from another food source. Why would anyone suggest cutting grains? Anti-nutrients in grains prevent absorption of vital minerals like calcium, magnesium, and iron. Carbohydrates in grains (and starches and sugars) raise glucose levels and therefore insulin levels. The way America eats grains (and sugars and starches), insulin is high “all the time.” Insulin’s job is to store fat for you. Also, high levels of glucose and insulin are inflammatory. When I say inflammatory, I want you to think of all kinds of things, like blocked heart arteries, dementia, and diabetes. Lectins in grains are exceptionally difficult for our precious first barrier, the gastrointestinal tract. They bind to our gut cells and can damage it, gaining access to our bloodstream to cause further distress in other cellular processes. Gluten in wheat, rye, barley, and triticale are very difficult to digest, and even if you don’t have celiac disease, it’s estimated 7% of the population still reacts to gluten: headaches, rashes, joint aches, and gastrointestinal effects. My blog is not about getting you to go grain-free. In fact, my blog is only to encourage you. Encourage you to seek ways to make food work for you and your family, not against you. Grains can be troublesome to many people, and aside from gluten, maybe you’ve never heard that. I didn’t even touch on gluten’s “morphine-type” effect, which some of us are likely very sensitive to (think carbohydrate cravings and morphine-type effect on bowels). Food matters. It’s not just about your weight, but I almost promise your weight will follow if you cut out all processed foods and eat only fruits/vegetables/meats. It’s about how you and your loved ones feel. Those crazy nagging health problems the doctor just ignores or can’t seem to help. Our family changed our eating and ditched lots of those problems. Post on SCD, GAPS, Paleo, Primal, and Whole 30 diets/nutritional intervention programs to follow soon. This entry was posted in Nutritional Intervention and tagged do you have to eat grains, GAPS, grain free diets, paleo, primal, SCD, whole 30 on June 20, 2013 by thehomeschoolingdoctor. Well, isn’t that just an invitation to cook with olive oil? Is olive oil really a ticking time bomb under cooking heat? The taste is divine and the liquidity super convenient. Do I need to feel remiss for blogging the recipes I cook and bake with olive oil? Bottom line first: Baking and cooking at fairly short, typical kitchen temperatures minimally changes olive oil, but not enough to stress me out. Most importantly with olive oil, you get what you start with. Many (maybe most) olive oils are well-degraded before you ever open the bottle, and cooking only intensifies that. Start with good quality, fresh olive oil. If you don’t, you may as well catch it on fire. Oxidation at its finest! Opa! Oh, yeah. And to get the full benefits of olive oil, make sure and use some uncooked every now and then (I opt for 2-3 times daily)! Since you get what you pay for and you want to get your nickel’s worth–lick the plate. Yum. A quality extra-virgin olive oil–it’s that good. If you want a little more detail on the “can I cook with olive oil” question–keep reading. If you want a lot more, read the sources listed at the end. Can I feel comfortable using olive oil for cooking and baking? Doesn’t olive oil degrade with heat? Yes. It does. And also with exposure to light and oxygen. In fact, there’s a good chance your store-bought olive oil is rancid before it has even gotten to you. Ideally your olive oil would come in a glass or stainless steel container from a well-stored supply that was properly shipped and wouldn’t be sitting under bright fluorescent grocery lights. 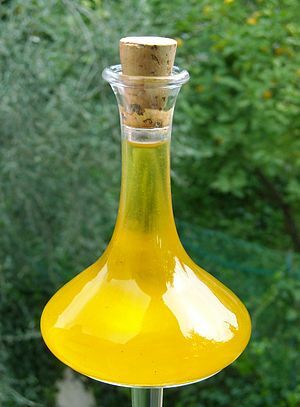 Quotes below elaborate on what keeps olive oil from oxidizing. And finally, are you that consumer? Okay, but you’re pretty sure you’re buying “FRESH pressed olive oil”, nearly off the tree! So it’s good when you pour it (you think)! What about cooking? Can you cook with it? Doesn’t it ruin it? Make it DANGEROUS? Nah. It doesn’t magically form wicked trans fats or sorely picked on, probably unjustly, saturated fats. However, its beneficial compounds will degrade with cooking heat, just like when it sits next to your hot stove in a clear, plastic bottle on a sunny day. Just like it could in that iron vat mentioned above–perhaps long before it ever reached you. Way back in Italy or Spain. I feel comfortable cooking and baking with olive oil at my typical ranges of about 300-400 degrees Fahrenheit (149-204 degrees Celsius). And my typical times of about 10-30 minutes. Why? What makes me say that? “Effects of Conventional Heating on the Stability of Major Olive Oil Phenolic Compounds by Tandem Mass Spectrometry and Isotope Dilution Assay” has a nice table (Table 1) looking at olive oil’s phenolic compounds’ breakdown at typical cooking temperatures. There are other components that make olive oil beneficial, but phenols are some of the most labile ones. I feel pretty comfortable that my usual 375 degree Fahrenheit (180 degrees Celsius), 20 minute roasting of vegetables does not allow enough time for much degradation of the beneficial compounds in olive oil. Table 1 in the article (I couldn’t copy it and paste it. Sorry.) lists eight phenolic compounds. Three of the compounds get diminished by about 50% at 30 minutes of 338 degrees Fahrenheit, and the rest have fairly negligible deterioration. About nothing I cook with olive oil exceeds 375 degrees Fahrenheit (191 degrees Celsius) for longer than 20-30 minutes. So if I’m starting with a great oil, I shouldn’t be oxidizing the poor stuff beyond its beneficial use. Smoke point of virgin olive oil is about 400 degrees Fahrenheit (204 degrees Celsius), but it will vary from brand to brand, year to year, location to location. I like to find a fresh, peppery extra-virgin olive oil for a needed robust flavor and a milder one for things like mayonnaise or baking. But if I’m out of one or the other, I just use what I have. Cloudy olive oil actually suggests an oil with more stability; oxidation occurs more slowly. I really help this helped you! Have a great day (or night)! (2) Attya M, Benabdelkamel H, Perri E, Russo A, Sindona G. Effects of Conventional Heating on the Stability of Major Olive Oil Phenolic Compounds by Tandem Mass Spectrometry and Isotope Dilution Assay. Molecules. 2010; 15(12):8734-8746. This entry was posted in GAPS, Nutritional Intervention and tagged Can I cook with olive oil, GAPS, paleo, primal, SCD, whole 30 on June 13, 2013 by thehomeschoolingdoctor. Our way of eating has become second nature. I almost forget we don’t eat like other people. We have one cookbook that allows us to fly incognito when we are forced out of our cave or people invade, which actually happens quite often. Especially that “invade your cave” part. People with kids much prefer invading caves that other people have to clean and cook in. Which is okay…because I have better control over the food that way! Our favorite cookbook has to be The Gluten-Free Almond Flour Cookbook written by Elana Amsterdam. It keeps us with an appearance of eating normal. I modify all the recipes to be legal with our nutritional overhaul, GAPS (or Paleo or SCD or Primal or Whole 30–you get the idea). Most recipes don’t mind the transition a bit, but some put up a resistance. Pancakes put up a fuss. Pancakes love flour more than I did. They really must want the arrowroot powder Elana uses, too. Elana’s pancake recipe yells at me when I try making substitutions. See? 1. I can’t make them as big as I want to. Four inches in diameter is all I can get away with. No “big as your head pancakes” here. Bummer. Addendum: My daughter just got a 7 incher!!! 2. I can’t cook them as hot as I want to. The heat must be medium-low (340 degrees Fahrenheit if you have an electric griddle) or else they’ll burn. 3. I can’t flip them when I want to or they’ll muck up my skillet and spatula and beautiful, mean sounding, songs will fill the kitchen air. 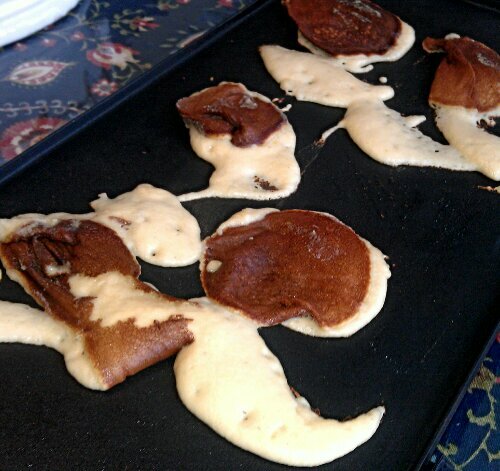 (“What’s wrong, mommy?” It’s just a pancake, but it’s my job now.) Patience is required as to when to flip these. I keep my burner low and practice patience. This staying home stuff is a cinch. All that technical stuff, that’s just the stuff they omit from cookbooks. So go ahead, try this recipe. See what you think. My kids think they taste like the real deal. Flying under the radar again. Follow the one dump method: Combine all ingredients into one large bowl and mix well with a hand-held electric mixer until smooth. Adjust consistency with water as needed. Err on the side of not too runny. It’s kind of like muffin batter, a bit thinner. Use a scant 1/4 cup batter for each pancake. Push the batter around a bit to form into a 4 inch diameter circle. 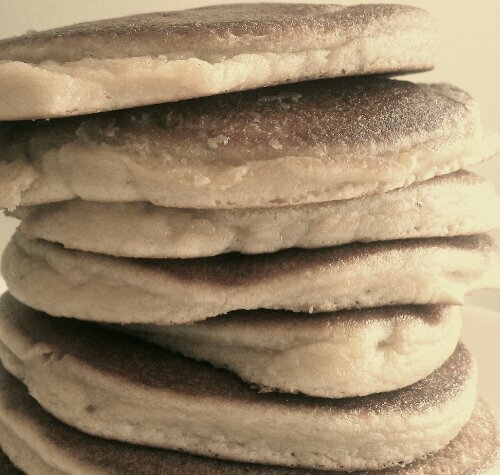 If you want teeny-tiny, easier to manipulate pancakes, use a tablespoon to dole out the batter. Cook (PATIENTLY) until the underside is golden brown and set firm, about 3 minutes for the first side. 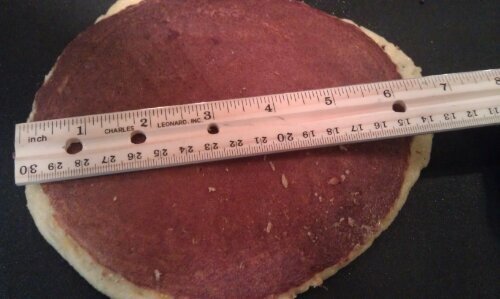 If your spatula will not easily slide under the pancake, it’s not ready! Cook other side until golden brown and transfer to a plate. 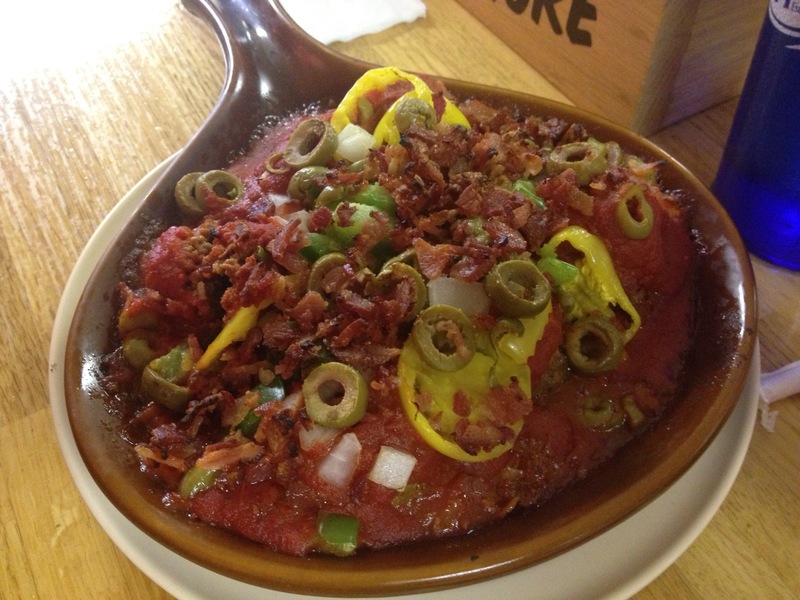 Serve with desired topping choice. 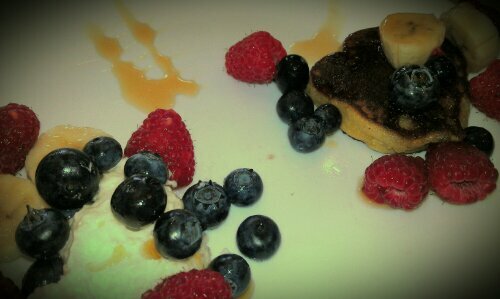 My girls plated the pancakes you see here with coconut cream, blueberries, bananas, raspberries, and a drizzle of Dad’s (my dad) maple syrup. I hope your eating and health is shining. If not, don’t give up. Persist. You can do it. It is worth it. This entry was posted in Recipes and tagged dairy-free, GAPS, gluten-free, grain free, paleo, pancakes, primal, SCD, whole 30 on May 29, 2013 by thehomeschoolingdoctor.